Hope all of you experiencing this horrible blast of winter are enjoying a little reprieve from the cold. Sounds like some of your temperatures south of the border were a lot cooler than even up here in Chilly Canada!!! It's warming up here a touch, so I'm hopeful I can get back to enjoying longer walks. 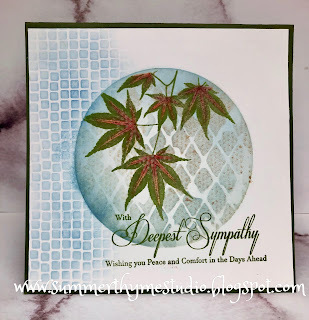 I also used one of the beautiful sentiments from the with Sympathy set. 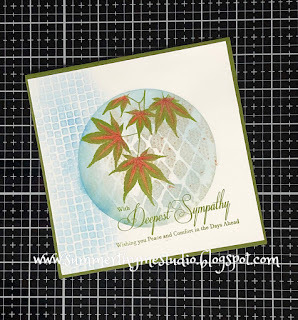 Then I stamped the Maple leaves. I then layered a grunge dot stencil over top of that and sprayed some Harvest Sunset Shimmering Bliss. I've got a video of the process, but of course with doing my first video, I didn't figure out the editing until this morning. It should be up on my blog later today!!!! Lastly, I added the sentiment and then a little more stencilling along the side with the simple mosaic stencil!!!! Hope you have an amazing day!! !